Analysis of aggregate and individual Web requests shows that PageRank is a poor predictor of traffic. We use empirical data to characterize properties of Web traffic not reproduced by Markovian models, including both aggregate statistics such as page and link traffic, and individual statistics such as entropy and session size. As no current model reconciles all of these observations, we present an agent-based model that explains them through realistic browsing behaviors: (1) revisiting bookmarked pages; (2) backtracking; and (3) seeking out novel pages of topical interest. The resulting model can reproduce the behaviors we observe in empirical data, especially heterogeneous session lengths, reconciling the narrowly focused browsing patterns of individual users with the extreme variance in aggregate traffic measurements. We can thereby identify a few salient features that are necessary and sufficient to interpret Web traffic data. 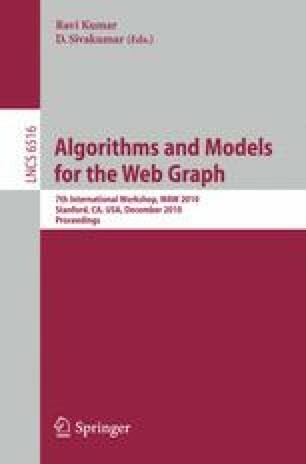 Beyond the descriptive and explanatory power of our model, these results may lead to improvements in Web applications such as search and crawling.